The UK bee population is declining at more than twice the rate of that in Europe, according to a new University of Reading study. The research, published online last week by Dr Simon Potts and colleagues, has shown that there has been a 54% decline in England in managed honey bee populations over the last 20 years, compared to an average of 20% across Europe. 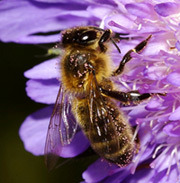 Dr Potts, from the University of Reading's School of Agriculture, Policy and Development, has been invited to speak at a Parliamentary seminar this week to discuss the implications of a decline in pollinators, such as the honey bee. He will join a panel of speakers at Westminster on Wednesday, 20 January, to talk on Insect Pollination: Causes and consequences of decline, organised by the Parliamentary Office of Science and Technology. Pollination by insects is vital for agricultural production and maintenance of biodiversity - 80% of British wild flowers and 84% of EU crops depend on insect pollinators, mainly bees. The research, Decline of managed honey bees and beekeepers in Europe, looked at data from 18 countries to quantify the extent of changes in honey bee colony numbers and beekeepers since 1965. There were different patterns across the countries but a mite which attacks honey bees infested virtually every honey bee colony. The study recommends a standardization of evaluation methods across to Europe to draw up a more accurate picture. Dr Potts said: "Harmonized reliable methods will be the obvious backbone for any research to understand and mitigate honey bee colony losses. "Opportunities such as the Parliamentary seminar are ideal for alerting policy makers to the dangers to the bee population and the actions needed to overcome further losses of honey bees." Dr Simon Potts is available for interview. Please call the press office number above to arrange. If you would like a copy of this article, please contact the press office on the number above. The School of Agriculture, Policy and Development is a world leader in teaching and research in the natural and social sciences relating to agriculture, the food chain, rural environments and the countryside and international development. In the RAE 2008, 45% of its outputs were rated as either world leading or internationally excellent. Reading is the UK's top university for impact in Agricultural Sciences research (ISI Web of Knowledge, Essential Science Indicators).